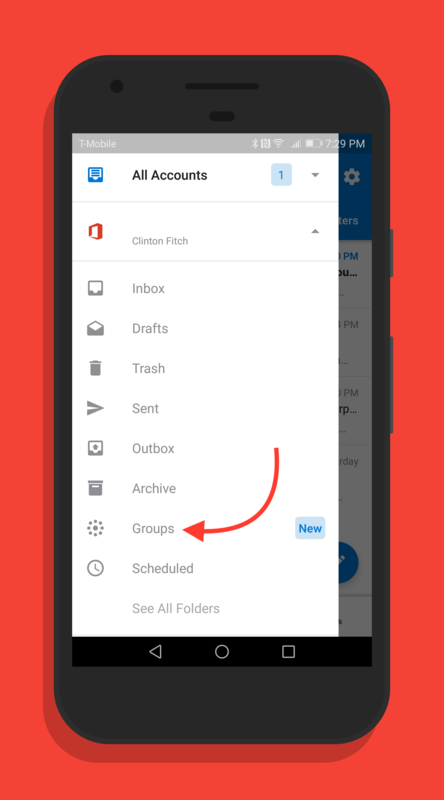 Microsoft has released an update to Outlook for Android that Office 365 users who use Groups will find helpful. You can now access groups from within the client, allowing you to see and send messages to teams within your organization. To this point, Groups has been something that has only been available through the Outlook client on PC and Mac. For those that may not know what Groups is exactly, think of it as a dramatically improved distribution list. Now you can send emails to the group and everyone will get those emails (like a distribution list) but it also allows for much easier document sharing and collaboration over sending endless versions out to people. Files can be shared from OneDrive which makes version tracking much easier and it eliminates the risk of multiple version of a file running around within your organization. Groups was introduced for Windows users last year and to Mac users in the Outlook client back in March. With it now available for Android, it will make it easier for those who use the feature to keep up with things (and keep others informed) while on-the-go. to Outlook, open the menu and navigate to your corporate or education account. There in the listing you will see Groups which you can then tap and share emails and cloud-based documents. If you have Outlook installed on your phone or tablet, the update should be hitting your devices this week thanks to an OTA update. If you want to try Outlook, it is free and you can use it with any Live or personal Office 365 account as well as Gmail and other email services.